Timing Chain Kit Balance Shaft Water Pump FOR 00-11 GM 2.0 2.2 2.4 L61. GM / CHEVROLET/ OLDSMOBILE/ PONTIAC/ SATURN. 2.0L / 2.2L / 2.4L DOHC L4 (16 Valve) Ecotec. 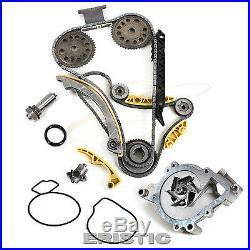 Brand New Timing Chain Kit W/ Updated Tensioner + Balance Shaft Set + Water Pump. 2002 - 2005 CHEVROLET CAVALIER 2.2L 134 L4 DOHC, 16V, VIN CODE "F". 2004 - 2005 CHEVROLET CLASSIC 2.2L 134 L4 DOHC, 16V, VIN CODE "F". 2005 - 2007 CHEVROLET COBALT 2.0L 122 L4 DOHC SUPERCHARGED, 16V, VIN CODE "P". 2008 - 2010 CHEVROLET COBALT 2.0L 122 L4 DOHC TURBOCHARGED, 16V, VIN CODE "X". 2005 - 2008 CHEVROLET COBALT 2.2L 134 L4 DOHC, 16V, VIN CODE "F". 2009 - 2010 CHEVROLET COBALT 2.2L 134 L4 DOHC, 16V, VIN CODE "H". 2006 CHEVROLET HHR 2.2L 134 L4 DOHC, 16V, VIN CODE "D". 2009 - 2011 CHEVROLET HHR 2.2L 134 L4 FLEX DOHC, 16V, VIN CODE "B". 2007 - 2008 CHEVROLET HHR 2.2L 134 L4 DOHC, 16V, VIN CODE "D". 2004 - 2008 CHEVROLET MALIBU 2.2L 134 L4 DOHC, 16V, VIN CODE "F". 2002 - 2004 OLDSMOBILE ALERO 2.2L 134 L4 DOHC, 16V, VIN CODE "F". 2007 - 2008 PONTIAC G5 2.2L 134 L4 DOHC, 16V, VIN CODE "F". 2009 PONTIAC G5 2.2L 134 L4 DOHC, 16V, VIN CODE "H". 2002 - 2005 PONTIAC SUNFIRE 2.2L 134 L4 DOHC, 16V, VIN CODE "F". 2002 PONTIAC SUNFIRE 2.4L 146 L4 DOHC, 16V, VIN CODE "F". 2009 SATURN AURA 2.4L 145 L4 DOHC, 16V, VIN CODE "B". 2007 - 2009 SATURN AURA 2.4L 145 L4 DOHC, 16V, VIN CODE "5". 2004 - 2007 SATURN ION 2.0L 122 L4 DOHC SUPERCHARGED, 16V, VIN CODE "P". 2003 - 2005 SATURN ION-1 2.2L 134 L4 DOHC, 16V, VIN CODE "F". 2003 - 2007 SATURN ION-2 2.2L 134 L4 DOHC, 16V, VIN CODE "F". 2003 - 2007 SATURN ION-3 2.2L 134 L4 DOHC, 16V, VIN CODE "F". 2006 - 2007 SATURN ION-3 2.4L 145 L4 DOHC, 16V, VIN CODE "B". 2001 - 2002 SATURN L100 2.2L 134 L4 DOHC, 16V, VIN CODE "F". 2002 - 2003 SATURN L200 2.2L 134 L4 DOHC, 16V, VIN CODE "2, F". 2001 SATURN L200 2.2L 134 L4 DOHC, 16V, VIN CODE "F". 2004 SATURN L300-1 2.2L 134 L4 DOHC, 16V, VIN CODE "F". 2000 SATURN LS 2.2L 134 L4 DOHC, 16V, VIN CODE "F". 2000 SATURN LS1 2.2L 134 L4 DOHC, 16V, VIN CODE "F". 2000 SATURN LW1 2.2L 134 L4 DOHC, 16V, VIN CODE "F". 2002 - 2003 SATURN LW200 2.2L 134 L4 DOHC, 16V, VIN CODE "2, F". 2001 SATURN LW200 2.2L 134 L4 DOHC, 16V, VIN CODE "F". 2007 - 2010 SATURN SKY 2.4L 145 L4 DOHC, 16V, VIN CODE "B". 2002 - 2005 SATURN VUE 2.2L 134 L4 DOHC, 16V, VIN CODE "D". 2006 - 2007 SATURN VUE 2.2L 134 L4 DOHC, 16V, VIN CODE "D". 2008 - 2010 SATURN VUE 2.4L 145 L4 DOHC, 16V, VIN CODE "P". 2007 - 2009 SATURN VUE 2.4L 145 L4 DOHC, 16V, VIN CODE "Z". 1 Timing Chain (148 links). 1 Tensioner (cam chain tensioner). 2 Cam Sprockets (46 links). 1 Crank Sprocket (outer-23 teeth). 1 Guide Rail (upper for cam chain). 1 Guide Rail (left for cam chain). 1 Guide Rail (right for cam chain). 1 Timing Chain (b/shaft chain)- 134 links. 1 Guide Rail (upper for b/s chain). 1 Guide Rail (left for b/s chain). 1 Guide Rail (right for b/s chain). 1 Crank Sprocket (42 teeth). 1 Balance Shaft Sprocket (intake sprocket). 1 Balance Shaft Sprocket (exhaust sprocket). Water Pump is driven by the balance shaft chain. This timing chain kit is designed for the professional installer. It does not come with any installation instructions. If you do not have a service manual, please consult a professional mechanic prior to installing this kit. Please refer to the listing pictures for an accurate description of the parts included in the kit. Will NOT Fit Cobalt & HHR 2.4L due to the difference of the intake & exhaust cam sprockets. THE TEAM ARE HAPPY TO HELP. Discount for multiple items is available. We strive to provide 5-star customer service. Opened or installed parts will not be accepted. The above limitations may not be applicable in your states. We are here to help you. The item "Timing Chain Kit Balance Shaft Water Pump FOR 00-11 GM 2.0 2.2 2.4 L61" is in sale since Tuesday, August 05, 2014. This item is in the category "eBay Motors\Parts & Accessories\Car & Truck Parts\Engines & Components\Timing Components". The seller is "eristicgaskets" and is located in South El Monte, California. This item can be shipped worldwide.